In this edition of Research Connections, find links to researchers in the news, updates on important deadlines, and more news for University of Rochester researchers. Email not displaying correctly? Ehsan Hoque, Assistant Professor of Computer Science, won a best paper award at the 2013 ACM International Joint Conference on Pervasive and Ubiquitous Computing (UbiComp 2013) for a computer system designed to help people practice social interactions. 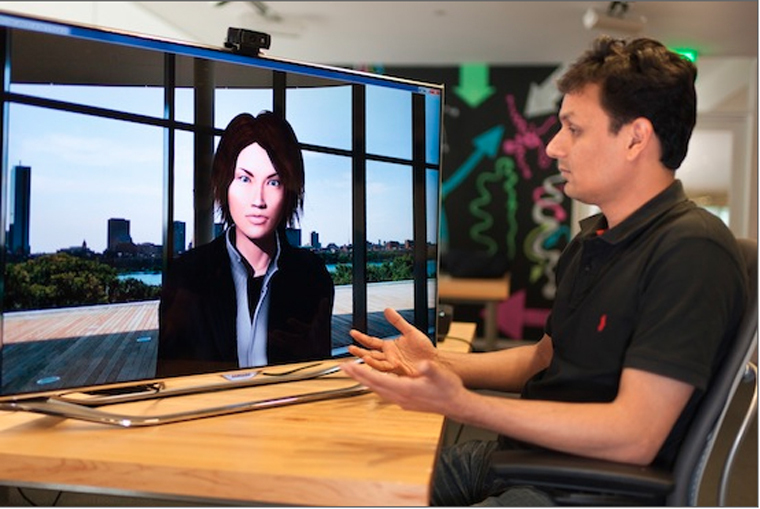 The system, called MACH (My Automated Conversation coacH), consists of an animated character that can see, hear and respond in real time. Ehsan Hoque had just defended his PhD dissertation at MIT in 2013 when he returned to his desk and found a voice mail from DARPA, the federal Defense Advanced Research Projects Agency. Officials at the agency had read a news story about Hoque's automated coach to help people with disabilities improve their social and speaking skills. They wanted the young computer scientist to drop by and give a talk. Hoque put DARPA on hold for three months to wrap up his affairs at MIT and move here to become an assistant professor in the Department of Computer Science. After he gave his talk, a DARPA program manager said, "we'd like to fund your work" to the tune of $120,000. "That was the first month of my appointment," Hoque adds. The role played by some good publicity in that first award from DARPA is not lost on Hoque. The coverage generated by news releases "had broader outreach compared to my research paper. I hate to say this, but the general public rarely reads research papers. They read a news story or a technical review." "I believe outreach is always useful," he added. "If it is a way for my research to be propagated, and for others to know about it, that's a good thing." During his talk at DARPA, he also made sure to explain his project in ways that people could relate to. "I talked about autism and helping people with social difficulty," Hoque recalled. "The project manager who wanted to fund me had family members with that condition, so she could relate to it right away. Making the connection is extremely useful because the people on the other end are also human. They also have emotions." Known as "LIRIC" (Laser Induced Refractive Index Change), this ground-breaking method also uses a laser to correct the optical properties of the eye, but that's where the similarities to LASIK end. This technology has been licensed to Clerio Vision, Inc., a local startup poised to bring this new treatment to market. Clerio was started by a team of entrepreneurs with proven track records — Mikael Totterman (VirtualScopics, iCardiac), Alex Zapesochny (Lenel, iCardiac), Scott Catlin (AMO, Abbott Medical Optics — and now with UR Ventures), and Sasha Latypova (VirtualScopics, iCardiac). The company successfully concluded an oversubscribed Series A round of fundraising with participation from three venture capital firms, and is considering a Series B round to further accelerate product and clinical development. They have proven efficacy in animal models and hydro-gels (contact lenses), and plan to conduct human studies early in 2016. In 2014, advocacy groups interested in privatizing public schools held a three-day private conference at an Adirondack lodge. The governor was scheduled to attend as the honorary chairman of the event, which cost $1,000 per participant. Some teachers and parents protested at what was dubbed "Picket in the Pines"; public educators who offered to pay $1,000 to attend were turned away; the governor ended up appearing not in person but by skype. David Hursh, Professor of Teaching and Curriculum at the Warner School, believes that this and other such gatherings are evidence of an effort by charter school advocates to change the face of public education, which is the subject of his forthcoming book, The End of Public Schools: The Corporate Reform Agenda to Privatize Education (Routledge). "There is a discourse shaping education policy — what schools are, who should run them — that's highly secretive," Hursh says. "The people shaping these policies are not elected officials or school boards; they're not teachers or parents who are involved in the schools. They are people who are unelected and unaccountable." Key players cited by Hursh include the Bill and Melinda Gates Foundation, the Walton Foundation, Pearson Inc. — a global supplier of school testing, curriculum and training products — and investors including hedge fund managers who profit from investing in charter schools. For example, as of March 2014 the Gates foundation had provided $2.3 billion to help implement national Common Core standards for math and English language in 45 states "with little transparency and next to no review," Hursh notes. "Common Core would not exist if Bill Gates had not poured billions into groups supporting it." For the past 20 years, Hursh has been writing about the politicization of standardized testing in New York state . His research on the influence of neoliberal organizations in shaping public education policy is widely cited. The worst case scenario, Hursh says, would be an increasing standardization of curriculum nationwide, delivered in charter-school type settings by non-union, non-tenured instructors who are periodically replaced to keep salary costs down. The result would be students who "don't really learn how to ask questions, to think, to organize their learning, but do what they're told in order to get a score on a test." Hursh is, nonetheless, heartened by a public backlash against the Common Core standards, as evidenced by the growing percentage of students whose parents allow them to opt out of Common Core-aligned testing. "To have people take that initiative to opt out is really incredible," Hursh said. "I'm surprised, pleased and optimistic that things might change. People are not accepting the argument, based on misleading Common Core testing results, that there is need for more privatization of schools. People are saying 'we'll work to improve the schools not through privatization but by working with the teachers and administrators.' "
University students, staff and faculty interested in entrepreneurship training and in identifying and developing valuable product opportunities from their academic research, can apply to the University of Rochester's I-Corps Site program by Nov. 16 for grants of up to $3,000. The NSF-funded program teaches the basics of entrepreneurship and helps teams grow and refine their venture ideas and develop a commercialization strategy. This will enable teams to either transition their work into the marketplace or apply for the NSF's six-week intensive I-Corps Team training program with the opportunity to be awarded a $50,000 grant. Read more here. Paul Audi has joined the Department of Philosophy as an associate professor. As a metaphysician and philosopher of mind, Audi's research focuses on the nature of properties and relations of determination and dependence. He writes that in the study of minds and morals, in order to definitively establish that some kind of entity exists, one must take a stand on what sorts of properties there are, which ones are fundamental, and how those that are fundamental give rise to those that are not. Audi's work on the concept of grounding has been at the center of recent debates about relationships of determination. A related strand of his work concerns mental causation and how mental phenomena could influence physical phenomena in the way that a commonsense understanding of human action assumes. Audi comes from the University of Nebraska–Omaha, where he was an associate professor (2013 to 2015) and an assistant professor (2007 to 2013). Prior to that, he was a visiting instructor in philosophy at Colgate University. Audi received his BA from Colgate University in 2001 and his PhD in philosophy from Princeton University in 2007. Ann Dozier, Acting Chair and Professor of Public Health Sciences, who has been selected as a fellow of the American Academy of Nursing. Dozier's research and fieldwork focuses on maternal and child health, with an emphasis on improving breastfeeding among low income women and reducing infant mortality. The scope of her work is to identify barriers to improving maternal child health, evaluate and identify the most effective ways to overcome these challenges, and work with providers and other organizations to promote the adoption of these best practices on a community-wide scale. Read more . . .
A new delivery system for protease inhibitors, when coupled with a drug developed at the School of Medicine and Dentistry, rids immune cells of HIV and keeps the virus in check for long periods, according to a study published in Nanomedicine: Nanotechnology, Biology and Medicine. The new regimens' long-lasting effects suggest that HIV treatment could be administered perhaps once or twice per year. The investigational drug delivery system, designed by University of Nebraska researcher Howard E. Gendelman, is a so-called "nanoformulated" protease inhibitor. The nanoformulation process takes a drug and makes it into a crystal, like an ice cube does to water. Next, the crystal drug is placed into a fat and protein coat, similar to what is done in making a coated ice-cream bar. The coating protects the drug from being degraded by the liver and removed by the kidney. When tested together with URMC-099, a new drug discovered in the laboratory of UR scientist Harris A. ("Handy") Gelbard, Professor of Neurology, the nanoformulated protease inhibitor completely eliminated measurable quantities of HIV. URMC-099 boosted the concentration of the nanoformulated drug in immune cells and slowed the rate at which it was eliminated, thereby prolonging its therapeutic effect. Read more . . .
A clinical trial performed across 42 research sites, including the University of Rochester Medical Center, found that a drug currently marketed under the trade name Nuedexta, which is approved by the Federal Drug Administration to treat a neurologic disorder, may also reduce agitation in patients with Alzheimer's disease. Nuedexta is a combination of dextromethorphan hydrobromide, which helps control emotions by acting at several different receptors in the brain, and quinidine sulfate, which inhibits the degradation of dextromethorphan, allowing it to reach therapeutic levels in the blood stream and brain. Though the trials lasted ten weeks, the drug "showed superiority over placebo starting at week one, which is unusually rapid onset of action for any pharmacological intervention for this condition," says Anton Porsteinsson, Professor of Psychiatry. "Any which way we looked at this group, (the) drug was superior to placebo in terms of reducing agitation." Read more . . .
Elaine Hill, Assistant Professor of Public Health Sciences, has received a $1.25 million Early Independence Award from the National Institutes of Health (NIH) designed to boost researchers at the beginning of their careers. The grant will enable Hill to study the complex local health, environmental, and economic implications of oil and gas extraction in the U.S. "I am so grateful that my research will be supported by this award," said Hill. "With it, I will be able to study a topic that is both timely, relevant, and in desperate need of scientific examination." The NIH Director's Early Independence Award was created to help jumpstart the careers of promising young scientists by allowing them to forego years of traditional post-doctoral training and begin to immediately pursue independent research. Read more . . .
Sage Begolly, Toxicology, "Response of oligodendrocyte progenitor cells to single dose and fractionated irradiation: potential implications for central nervous system radiation late effects." 1 p.m., Nov. 5, 2015, K-307 (3-6408). Advisor: Kerry O'Banion. Oct. 26: The tension between hybridization and reproductive isolation, Daniel Garrigan, Assistant Professor of Biology. Department of Biology Donut Talk. Noon to 1 p.m., Lander Auditorium - Hutchison 140. Oct. 30: Applications due no later than 5 p.m. for CFAR Joint Funding Opportunity in HIV/AIDS through SMD, SON and Program Of Excellence. Click here for details. Nov. 2: Initial abstracts due for applications for funding from Medical Center Incubator Program. Details and application instructions are available here. Nov. 2: Applications due for funding from the Health Sciences Center for Computational Innovation for short-term, early phase work necessary to create computer code or models, and to get new biocomputational or health-related scientific projects underway. Click here to read the full RFA. Nov. 10: "Developing a Regulatory Science Training Program and Potential Career Paths," presented by Emma Meagher, Director, Translational Research Training Programs and Senior Associate Dean for Clinical Research, University of Pennsylvania Institute for Translational Medicine and Therapeutics. Noon to 1 p.m., Helen Wood Hall Auditorium. Part of the "Advancing Regulatory Science and Translational Science: Research, Training and Partnerships" lecture series. Nov. 14: Healthcare Deep Data Dive, exploring innovative and effective uses of health data to improve patient outcomes. 8 a.m., Saunders Research Building. Learn more here. Nov. 16: Deadline for University students, staff and faculty interested in entrepreneurship training and in identifying and developing valuable product opportunities from their academic research, to apply to the University's I-Corps Site program for grants of up to $3,000. Read more here. Rochester Connections is a weekly e-newsletter for all faculty, scientists, post docs and graduate students engaged in research at the University of Rochester. You are receiving this e-newsletter because you are a member of the Rochester community with an interest in research topics.